Location in Albany Coonty an the state o Wyoming. Grand Avenue, near the Varsity o Wyoming. Laramie is a ceety in, an the coonty seat o Albany Coonty, Wyoming, Unitit States. The population wis 30,816 at the 2010 census. Locatit on the Laramie River in sootheastren Wyoming, the ceety is wast o Cheyenne, at the junction o Interstate 80 an U.S. Route 287. ↑ "Population Estimates". United States Census Bureau. Retrieved 2013-06-01. ↑ "Profile of General Population and Housing Characteristics: 2010 Demographic Profile Data (DP-1): Laramie city, Wyoming". U.S. Census Bureau, American Factfinder. Retrieved June 10, 2012. 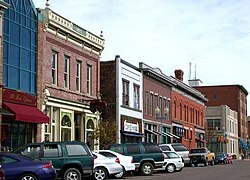 Wikimedia Commons haes media relatit tae Laramie, Wyoming. "Laramie". Encyclopædia Britannica (11th ed.). 1911. This page wis last eeditit on 11 Mairch 2018, at 17:20.